Last Tuesday night the Jackson Five took in a fabulous hockey game. The sea of red cheering on the Washington Capitals in Game 7 of Round 1 of the Stanley Cup Playoffs was something to behold. 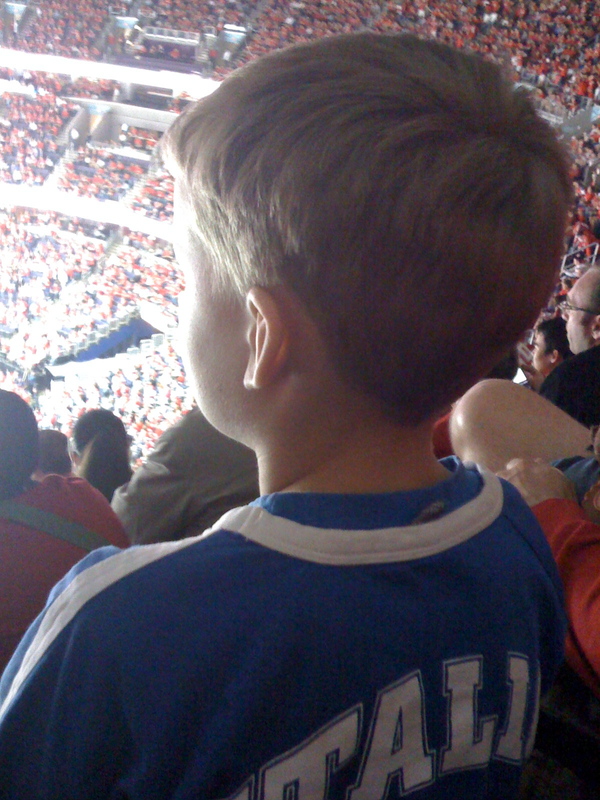 Nate, our five-year-old pictured above, was one of about seven Rangers fans at the game. It was easy to count them up because not only was every other person wearing red, but most were wearing CAPS paraphernalia. In fact the majority of those in attendance were wearing jerseys. Do you know how much an NHL jersey costs? I mean, it was a true display of devotion. By God’s grace, with three boys, I like sports. In fact, I love sports. But something about this event was over-the-top. You’d think the result of the game really mattered, like what we were witnessing wasn’t a game at all. And if you stop to think about it, it makes perfect sense that people act like that. Displays of devotion, and expressions of awe come naturally to us as human beings. We were made to worship, and everyone worships something. Some worship the earth itself, devoting themselves to preserving and caring for the environment. Some worship money and their lives are defined by the acquisition of wealth. Some worship Hollywood, reading piles of magazines and following the lives of their beloved stars with religious zeal. Still others worship pleasure, and their pursuits focus on the next big thrill or feel good high. Sadly, sports fans sometimes let the fun of a game become something of a god. Martin Luther said, “That to which your heart clings is your god.” And while only the God of Heaven can truly know what is in one’s heart, a person’s priorities — how they spend their time, their money, their talents–are surely an indicator of inner passions. And in terms of examining our own hearts, these are valuable considerations. So who or what do you worship? What does your heart cling to? It clings to something. Clingy devotion is in our DNA; we are beings who worship. We may laugh at how the Israelites built that golden calf and then started to worship the heap of metal like it could really help them. It may strike us as outrageous after marching through the Red Sea on dry ground, but we all seem to suffer from spiritual amnesia and they didn’t have all that we have. It is not like they chose to watch television for hours while the Bible, the revealed Word of God, sat next to them on the table. And they didn’t have the life of Jesus to emulate either, not to mention the omnipresence of the Holy Spirit. So I find Luke 12:48 rather sobering; it tells us that to whom much is given, much is expected. My prayer and hope this week is to cling to and worship three Persons–no one and nothing else. Only our Heavenly Father, His Son (our Savior), and His Spirit (our Counselor) are worthy of such praise and honor. May we worship this week in spirit and in truth. (John 4).